Bayer Garden Toprose Gold Rose & Shrub Feed 1kg Pouch with added seaweed extract is a granular plant food that contains the ideal boost of nutrients for bright and healthy roses and shrub plants. Increases root development and encourages efficient nutrient absorption. 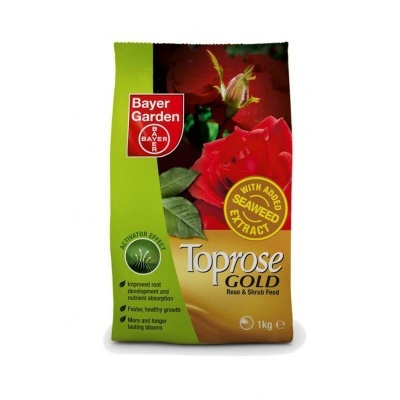 Beneficial when new rose bushes and shrubs are being transplanted. Apply by scattering on the soil surface and water thoroughly. 1kg Pouch Covers up to 20m2. Activator Effect means faster growth, and longer lasting blooms. For optimal results apply every 3 weeks during the growing season.